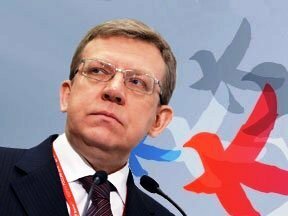 Russian politics: is Kudrin the cure for Putin’s ‘tandem malaise’? Vladimir Putin may have won the presidential election, but the Kremlin is still in the acute phase of its political crisis. The internet is awash with anti-Putin material; mayoral elections in various Russian cities are being won by ‘United Russia’ opponents and the opposition is gearing up for the March of Millions very soon…. Will the Kremlin be able to regain lost political stability or is Pandora’s box now open to allow the forces streaming from it to bring down the Putinesque vertical of power? Opinions vary. What is, however, clear is that there’s no way Putin and his team will be able to even begin emerging from the systemic political crisis until, at the very least, the factor that provoked the political crash of autumn/winter 2011, probably most accurately described as ‘tandem malaise’, has been eliminated. ‘Tandem malaise’ is essentially the result of Russian society’s proven unwillingness to recognise as legitimate the carnival ‘two emperor’ system, one with nominal, and one with real, power, that it was offered in 2008. 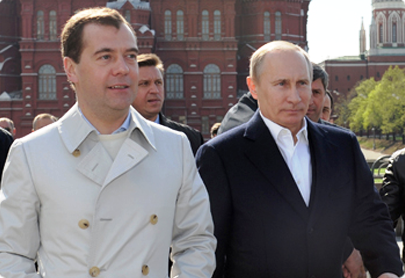 Dissatisfaction with this quasi-constitutional political model increased throughout Dmitry Medvedev’s powerless presidency and Vladimir Putin’s all-powerful premiership. When Putin and Medvedev publicly announced their upcoming ‘castling’ [chess term – job swap] at the ‘United Russia’ party conference on 24 September 2011, it was obvious that the tandem game would be continuing into the future and Russia was gripped by an unprecedented political crisis. After the flaring of discontent provoked by the news of the ‘swap’, there were forceful protests against electoral rigging of first the parliamentary, then the presidential, election. This was a first for the long years of ‘managed democracy’: it brought about a sharp decline in Putin’s authority and, consequently, partial de-legitimisation of the personalised power regime obtaining in Russia (more detail in my previous article). After these events, a purely mechanical ‘job amputation’ of Medvedev will clearly be insufficient and anyway the Kremlin has to convince at least a part of the anti-government lobby that the long-awaited period of reform and ‘dialogue with the government’ is really about to start. In the context of the Kremlin’s imminent release from the ‘tandem malaise’ and the transition to new reforming policies, it is not difficult to see where the recently created Committee of Civic Initiatives is coming from. Headed by the ex- Finance Minister Aleksey Kudrin, its members represent the so-called liberal right wing. These include the ex co-chair of the SPS [Union of Right Forces] Leonid Gozman (Anatoly Chubais' right hand man]; the head of the support organisation for SMEs 'OPORA Russia', Sergei Borisov; economists Yevgeny Yasin, IgorYurgens and Evgeny Gontmakher (the last two worked on President Medvedev's 'modernisation concept' at one time); the head of the National Anti-corruption Committee Kirill Kabanov; political analyst Dmitry Oreshkin; TV journalists Vladimir Pozner and Nikolai Svanidze and the film producer Yuly Gusman. 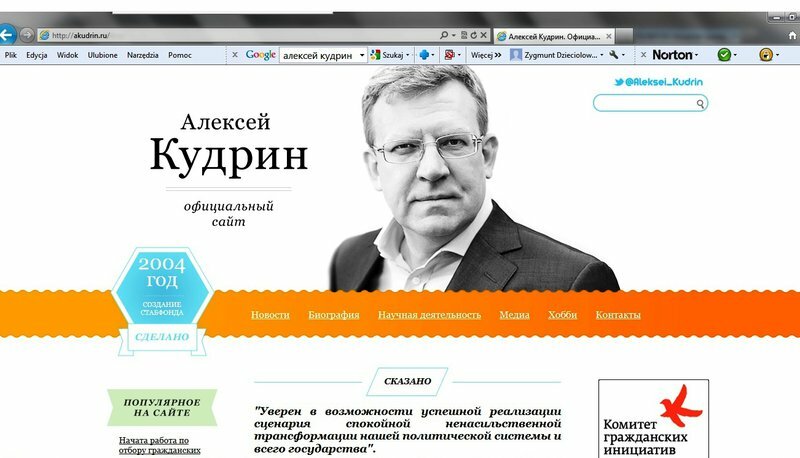 Aleksey Kudrin's personal website www.akudrin.ru is the best source of information about the activities of the Civic Initiatives Committee. Kudrin recently wrote a comprehensive article in the journal 'Economic Policy', entitled 'What do we expect from the government?' and laying out ten basic areas of work for the future cabinet of ministers. The very fact of its publication and the content of the article make this in essence his application for the post of prime minister. It is a 'bracing memorandum' (typical for the Putin era) - restrained, in declarative-modernising mode, containing nothing really new, except possibly the original idea of a 'partnership' between government and society. In this context Kudrin regards the partnership model as a situation whereby society understands and approves government policies aimed at a systemic tightening of belts in the public sector. The fact that it's Aleksey Kudrin who is setting his cap at the post of prime minister and that his initiative is most probably tacitly approved by Putin seems completely logical, as his hypothetical candidature combines several features that would suit Putin, especially in today's crisis conditions. 1. Kudrin was Minister of Finance for 11 years and one of Putin's most loyal and reliable ministers. Putin continues to trust him, even after he resigned from his post, and comments on him very favourably, thanking him for the 'firmness, responsibility and probity' he displayed during the crisis. 2. Throughout his 11 years in post Kudrin managed to preserve his reputation as a liberal within the system, not unsympathetic to the idea of common-sense reforms, and respected in the West – Euromoney magazine named him Finance Minister of the year 2010 – so he is positively regarded by some of the anti-government lobby. He cemented his image as a principled reformer still further by resigning immediately after the announcement of the imminent job swap, saying that he would not work under Medvedev, because he leans toward populist financial policies. Kudrin made no reference at all to Medvedev's total absence of independent policies during his four years as president and the fact that his populism was fully cleared with Putin. Nevertheless, many people regarded Kudrin's resignation as a bold and principled step. It was, therefore, hardly surprising that some time later he was dispatched as a parliamentary representative to the mass protest demonstrations in Moscow and even addressed one of their rallies. 3. Kudrin represents the particular kind of right-wing liberal which has been cultivated by the Kremlin, whose main task is to deploy scientific and economic rhetoric to mask hardline financial policies aimed at minimising the state's public sector liabilities to society. This is particularly relevant for the Kremlin at the moment, because the promises Putin and Medvedev made to curry favour with the voters during the two election campaigns would be too heavy a drain on public finances. The Kremlin is thus faced with the two jobs of overcoming the 'tandem malaise' as quickly as possible and putting together the kind of government which will secure the support of even a part of society. In this situation it would be difficult to think of a better candidate for the post of prime minister than Aleksey Kudrin. But what, then, is the point of the Committee of Civic Initiatives? As soon as Putin was elected, he could simply have issued his first decree appointing Kudrin prime minister. Why didn't he? He couldn't. On 24 September 2011 he had publicly promised that, when he became president, he would make Dmitry Medvedev prime minister, so he would have broken the current regime's unwritten rule that anything said in public by the Leader is law for the system. Life can, of course, make amendments to any spoken words, but breaking a publicly-uttered promise without any explanation or justification, 'just like that' - Putin couldn't do it. If his intention was simply not to abide by the promise he rashly made Medvedev (which is unlikely) or to appoint him prime minister and then dismiss him soon after (which is more likely), he will need to have very serious grounds for so doing. It is a fair assumption that the Committee of Civic Initiatives has been set up precisely to furnish the justification Putin so badly needs. The Kudrin committee thus has a dual purpose. First, to mount a critical attack on Medvedev by portraying him as an ineffectual populist politician, incapable of steering Russia between the implacably approaching financial and economic Scilla and Charybdis (which is what Kudrin has being saying for the past few months). Second, to develop a serious government programme which would enable Putin after some time to take the executive decision to exchange Medvedev for Kudrin. Some of the Committee members are former Medvedev economic advisers and the Kudrin programme differs very little in spirit or content from similar Medvedev era documents, but this appears not to worry any of the players in this complex Byzantine interlude at all. That Medvedev will finally be replaced by none other than Kudrin seems today axiomatic, though Putin's Byzantium could very well come up with an even more unexpected scenario. But, one way or another, the functions of 'the Moor doing his duty' [Schiller The Genoese Conspiracy] will almost certainly be allocated to the Committee of Civic Initiatives, whatever developments in the nomenklatura this brings about. If this happens, the Kremlin will have a chance to clamber out of the whirlpool of political crisis, even if only temporarily. There are actually no grounds for assuming that the 'Kudrin stabilisation' – if it actually happens – will be at all successful in achieving real modernisation in Russia. In fact, there is nothing in 'Kudrin's modernisation' which would help the country out of its archaic, imperial power vertical towards a liberal democracy. So, whether or not the Kremlin manages to cure itself of the tandem malaise, it will be unable to rid itself of the main sickness inherent in all corrupt authoritarian regimes: the fatal increase of unpopularity to which there is, as a rule, only one conclusion – a velvet revolution.